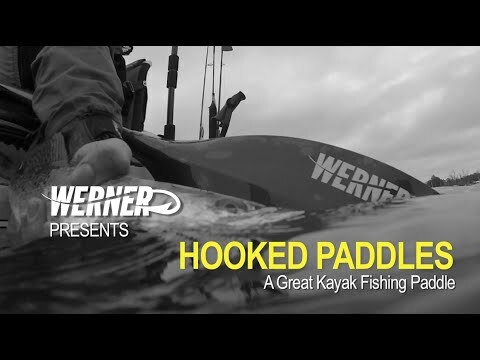 The Werner Skagit Hooked Fiberglass Straight Shaft Paddle is a great new angling paddle. The best angling paddle is of course the best paddling paddle and the Skagit is an unbeatable value for a fishing paddle that is suited well for new entrants and experienced fishing kayakers alike. The fiberglass nylon blades have the lightest swing weight at this price coupled with a smooth, stable stroke. Adjustable ferrule system is standard. Very nice paddle! It is very durable and strong but light even in the 260 cm size. I have many Werner paddles in various materials and sizes and like them all. This is a great kayak fishing paddle. I needed a durable paddle because I'm much harder on my fishing paddle than my touring paddle. The adjustable ferrule system works great and allows for quick, easy adjustments. If you are going to spend more than a few hours on the water at one time, a high quality paddle will make your trip much more enjoyable. Nice upgrade. I snapped my cheap plastic paddle and immediately went to AKC for info and a replacement. I read some of their articles and changed my mind on length and paddle shape. I ended up with this guy. It was available in the length I wanted, was a huge upgrade in everyway and it was a very reasonable price. Very happy so far. I bought one of these paddles several years ago, then sold it along with the boat. When the new boat arrived, I bought another paddle straightaway. The adjustable ferrule system is superior to any other I've tried, it's available in a 260cm length, and is a super value! Great paddle. It is the lightest I could find in this price range. I have no trouble positioning my yak one handed while battling a bass with the other hand. I can paddle farther and faster. This paddle blows away all others in the same price range. Only previous experience with kayak paddles were rentals. Cold aluminum shafts, heavy and one size fits all. The Skagit fiberglass paddle was none of the above. ACK helped size the paddle based on MY stature and the kayak I purchased . Chose the brown, goes great with my camo kayak. Could not be more pleased. We ordered two of these. They were shipped very quickly and arrived in good order. This is a very nice paddle and light, too. Very little fatigue using in the couple of outings we have gone on since purchasing. I just got into yaking. I bought a used yak and having been using my brother-n-law's paddle. He among other people said I should invest in a better paddle instead of going with a cheaper on. I am really glad I did. I love the length and the fact that I can adjust the angle of the blade. This is the best paddle that I have used. Ill never buy another Brand or size. You will not waist your money with this one. I'm 5'10" and bought the 230 for my Old Town Loon 106. It is the perfect length. ACK customer service is the best! I have a wide inflatable kayak and am 5'10" tall, so I went with the 250cm, which seems to work well for me so far. I also have a 240cm Tybee Hooked which seems a little more powerful (and tiring). I think the low angle style is usually more my speed when out in calm glassy lake conditions. Excellent value for the money! For the recreational kayaker, this paddle is a fine choice - it's affordably priced, light, nicely shaped, and the two halves lock up solidly tight. The blade could be a bit stiffer, but this is only noticeable when I'm paddling up-river and digging hard to push through the shallows. Getting the right length is really important. As a new 'yakker, I bought a cheap aluminum adjustable-length paddle and figured out my paddling style and optimum length ( low angle and 240 CM for my Ocean Kayak Tetra 12 Angler) and then spent the reasonable coin for a Werner paddle. Very happy with this purchase and with the customer service from ACK. This paddle is awesome. I got it in the 260 cm since I'm tall and have a large sit on top tandem kayak for me and the wife. The adjustments on the two piece are solid and easy to use. The only thing I wasn't 100% sold on was the size of the paddle in the water. For me it was a little on the small size and didn't give me as much push as I'd like. We got caught in a head wind headed home and paddling hard you could tell this paddle was slipping and fluttering for me, but I'm a big guy and this is supposed to be a touring paddle anyway. Well made, strong paddle. Somewhat heavy compared to other Werner paddles. I researched various paddles and I am glad I picked this one. It is light and the low angle makes paddling a pleasure. I ordered the 250 because the Feelfree lure is 36 inches wide. It is a perfect fit. 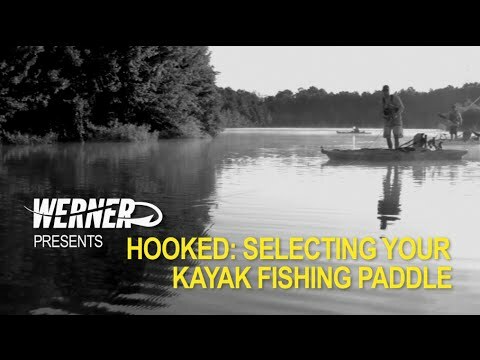 Werner Skagit Hooked Fiberglass Kayak Paddle Straight Shaft- The advice from your representative was spot on. I went with the 260 cm paddle for my Native Watercraft Ultimate. The paddle is light, stiff and the ferrule system feels solid. Several 4 hour trips were a breeze with this Werner. My heavy aluminum paddle is on permanent standby. Great paddle. Perfect for my needs. 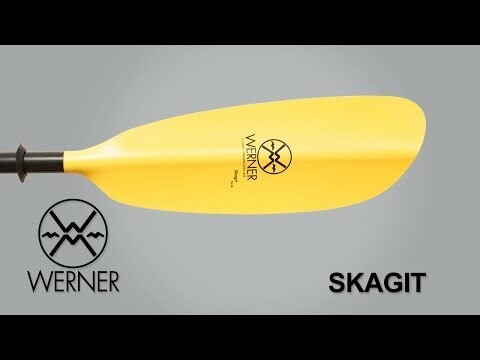 I purchased the Werner Skagit Hooked Fiberglass Kayak Paddle after considerable time spent in reading reviews. I am over 6 feet tall and paddle a new Native Watercraft FX 12 with a 30.5 in beam and seat capable of raising about 4 inches above normal paddle height so I followed the Werner paddle length guide and settled on the 260 cm paddle. It is perfect for my low angle method of paddling, well made and ACK's price plus free shipping was the best that I could find readily available. This is a winner paddle from a great source. Thanks ACK. Like the paddle but it doesn't fit in the kayak paddle holder as it is too large in diameter. I wish they had told me that as we had to run out and purchase a different paddle at the store. Does everything I needed, and lightweight. Black carbon shaft does get hot in the sun, but not bad enough for me to return. Good price and excellent ACK service. This is my first paddle. I have used a few rental paddles and they were alway alum.= heavy. This paddle is very light weight, a recent 8 hr trip was a joy. Fit and finish is very nice. I would buy again. I needed a longer paddle for use with my Slayer. Budget wouldn't allow anything more expensive. After determining that I was a low angle paddler, I chose this one in a 260cm length. I am very happy with my purchase, it is a very well made paddle, looks good, paddles very well, and I stay dry now. Can't go wrong at this pricepoint with this paddle. An excellent paddle. Fitting is tight and paddle is light for such a long one. I bought this paddle to use with my OT Discovery 119 and it is perfect with my lowered seat. An excellent choice to use with the 119 or similar canoes. I really like this paddle. Its quality and design features make it a pleasure to use. In hand, the grip is extremely comfortable and stays comfortable throughout the day. The drip guards do a great job, which really is nice because I often go out in my kayak to shoot photos. The paddle is light, well made, and highly effective as a low angle fishing paddle. I'm very happy with this purchase. A: The size of the paddle is determined upon the height of the paddler and the width of the boat. ACK would be more than happy to help you with the sizing. You can give us a call at 888-828-3828, or send us an email with your height along with the width of your boat. Q: Is the Skagit 230cm with a small shaft avalable online? A: We do not stock the Small Shaft, but we can look into special ordering it for you. Q: What is the difference between the hooked skagit and the normal skagit? A: Hi, The major difference between the paddles is going to be the blade material. A: Hi, Thanks for the question. These paddles to do come with 2 drip rings. One on each side of the paddle.